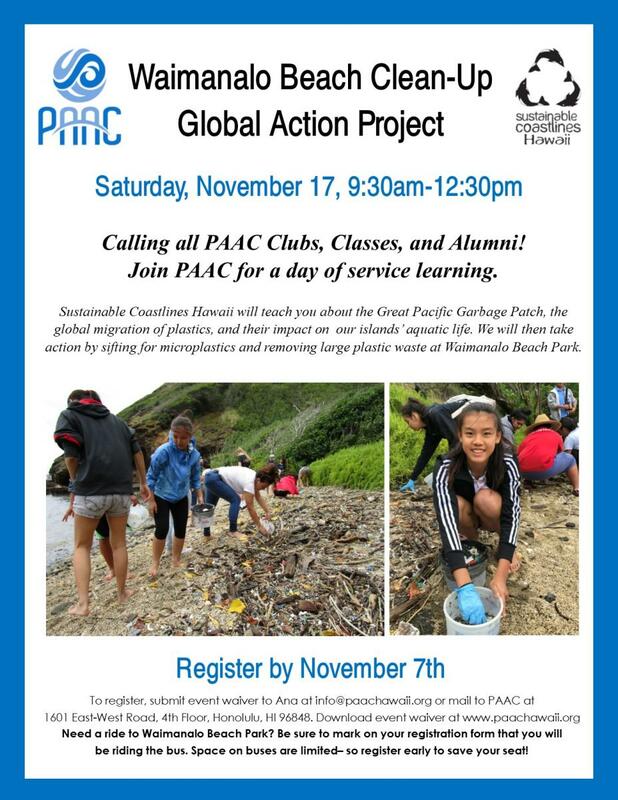 PAAC and Sustainable Coastlines are hosting a day of service learning at Waimanalo Beach Park for all PAAC Clubs, Classes, and Alumni on Saturday, November 17th, from 9:30am-12:30pm. This event is FREE. Sustainable Coastlines Hawaii will teach you about the Great Pacific Garbage Patch, the global migration of plastics, and their impact on our islands’ aquatic life. We will then take action by sifting for microplastics and removing large plastic waste at Waimanalo Beach Park. Register by November 7th. To register, submit event waiver to Ana at info@paachawaii.org or mail to PAAC at 1601 East-West Road, 4th Floor, Honolulu, HI 96848. Need a ride to Waimanalo Beach Park? Be sure to mark on your registration form that you will be riding the bus. Space on buses are limited– so register early to save your seat!